Premium quality, high performance telescopes for planetary and deep-sky observations as well as astrophotography and CCD imaging. The two-element objective lens is fully multi-coated and utilises special, extra-low dispersion glass for the virtual elimination of false colour. 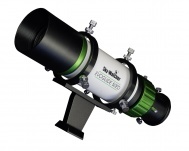 Performance of these telescopes will both delight and surprise the most critical observer, and can be genuinely compared to Apochromatic telescopes of other brands in price brackets normally way beyond the reach of the average user. ED Apochromatic Optics: ED glass elements minimise chromatic aberration, provide higher resolution and superior contrast. Colour fringing around objects is virtually eliminated with this type of optics. SkyScanTM PRO Computer-Control GOTO System: The hand controller allows pointing the telescope to a specific in the night sky at the touch of a button. The object database contains over 42,000+ objects, including complete M, NGC, and IC catalogues. The positioning accuracy is up to 1 arc minute with softwarecollimation error compensation. Period error correction (PEC) is included for astro-photography without auto-guiding. 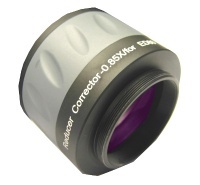 Crayford Focuser: The 2” Crayford focuser is backlash-free. The focuser wheels contain brushed-aluminium hubs with ridged rubber grip rings.